I came across the ConvertaStep lift earlier this month and felt its unique style and operation might benefit some of our visitors. 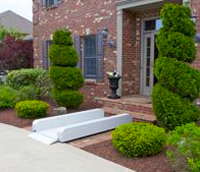 The ConvertaStep lift was designed by a wheelchair user who didn't want a huge ramp in front of his house and didn't need an expensive porch lift that required installation. 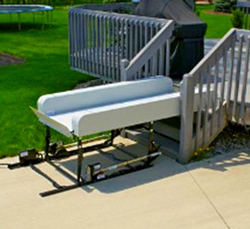 The ConvertaStep Lift is delivered pretty much fully assembled and simply is positioned in front of the steps leading to a porch or deck. 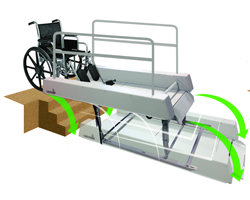 The user wheels onto the lift platform and the ConvertaStep lifts them in an inclined arc to the porch or deck surface. This lift is powered by a 12 volt battery that is kept continually charged by an automatic charger plugged into a a conventional 110 volt outlet. 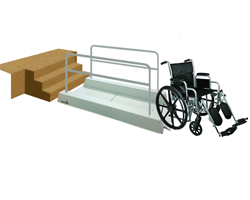 Its 31" wide platform and 750 lb weight capacity will allow its use with almost every wheelchair user. 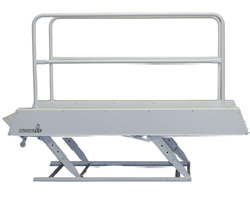 The ConvertaStep lift is available in three sizes and has controls mounted on the handrail and upper landing that raises or lowers the lift platform. The ConvertaStep lift, depending on the model chosen can travel up to 33" in a time period of between 8 and 15 seconds. 3 models offer adjustable range from 11" to 33"